At the advent of a New Year, I have the urge to organize and clean closets; out with the old, in with the new. I also feel compelled to use up half-filled condiments, those idle squatters taking up space in my refrigerator. This organizational urge dissipates as the year wears on, so I grab it by the horns when it’s ready to ride. An almost empty bottle of hoisin sauce (when did I purchase this?) inspires the evening meal. Hoisin is a marvelous Asian pantry staple; it’s a great flavor workhouse in recipes as it contains soy sauce, miso, molasses, ginger. I literally threw the recipe together with odds and ends from my pantry and freezer, producing a savory, delicious meal. To save time I cooked the edamame with the boiling pasta, but you will have more control over the level of doneness if these items are cooked in separate pots. Whisk together hoisin, orange zest and juice, and 1 teaspoon of sesame oil. Marinate scallops in 1/2 the mixture, 5 minutes on each side. Reserve remaining marinade. Meanwhile, bring a large pot of water to a boil. Cook noodles, stirring occasionally, according to package directions. In the last five minutes of cooking time, add the edamame. Cover pot to bring back to a boil. 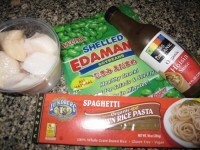 Drain noodles and beans and (if using rice noodles) rinse well. Toss with remaining marinade and sesame seeds. Using a slotted spoon, remove the scallops, reserving the marinade. Heat remaining 2 teaspoons oil in a large nonstick skillet over medium-high to high heat. Add the scallops and cook (without shaking pan) until golden brown and just cooked through,about 3 minutes per side. Transfer to a plate and cover with foil to keep warm. Add the reserved marinade from the scallops to the pan and cook over medium-high heat 1 minute. Add noodle mixture back to the pan, stir to incorporate sauce, and add scallions if using. 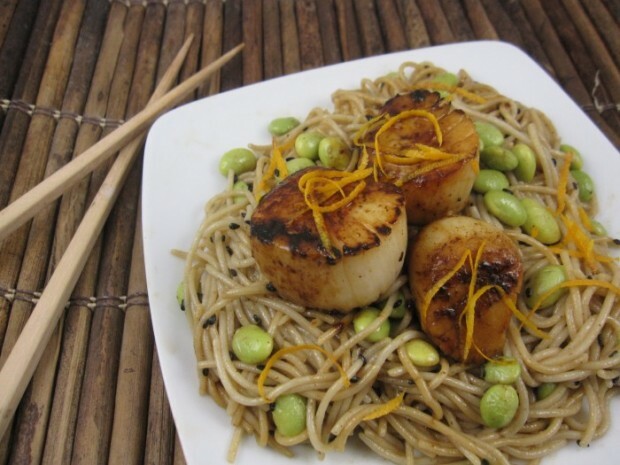 Top noodles with scallops and serve immediately, garnished with zest.